Wow! An incredible introduction to what it means to be trans, through the eyes of a person going through the transition from boy to girl. She shares what it was like when she was little, her sexuality, falling in love, coming out to the boy she loves, and traveling down the road through transition together. Truly powerful to feel the emotions along with her and those who love her, AND, packed with details about LGBTQ, and especially trans, issues, life, the universe and everything. Wonderful. 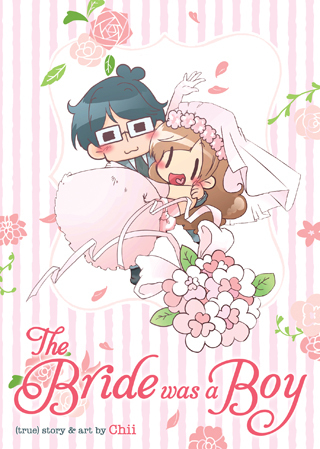 A diary comic with an upbeat, adorable flair that tells the charming tale of Chii, a woman assigned male at birth. Her story starts with her childhood and follows the ups and downs of exploring her sexuality, gender, and transition–as well as falling in love with a man who’s head over heels for her. Now, Chii is about to embark on a new adventure: becoming a bride! This witty charmer of a graphic memoir follows Chii from her early life as a boy through her whirlwind gender transition and storybook wedding. In exuberant style, Chii portrays some of her life’s most personal moments, big and small: her frustrations at not seeing a place for herself in Japanese culture, the emotional aftermath of multiple gender-affirmation surgeries, and even the adorably awkward marriage proposal by “Husband-kun.” Sprinkled throughout are primers on gender terminology and corrections to common misconceptions, such as that all trans people get surgery. The skill and sensitivity of translator Conrad is apparent in clear framing that emphasizes cross-cultural education and dialogue. The core of the narrative is carried by Chii’s art; her super-deformed style has a simplicity that makes it visually accessible, inviting readers to identify with her avatar, and hyperbolizes the energy of every scene so that readers can’t help but feel the dizzying lows and highs of Chii’s journey. Readers will cheer for Chii as she achieves her once-impossible dreams. Equal parts Trans 101 and tear-jerking rom-com, there’s no other manga quite like this fun (and revolutionary) book.